Adidas is coming up with a huge restock of the Yeezy Boost 350 “Pirate Black” on February 19th 2016. 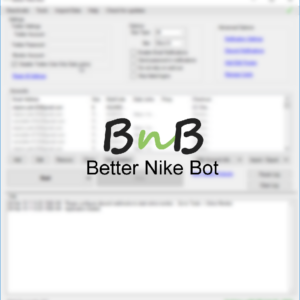 If you’re a part of #TeamBnb, please follow the instructions below to setup the bot. Otherwise, check us out here or see how we did on previous yeezy drops. Be prepared for sites going down. Errors like 503, 404, 410, time outs etc may all mean a site is down. 403 means you’re banned from the website. Use can use proxies to avoid ban. It’s important that you keep the bot running as long as you can. Sites do restocks from time to time on days following launch and its a good time to grab left over pairs. Our bot will not use shipping information on your accounts. Only what you enter in the bot (cc profile) will be used for checkout. 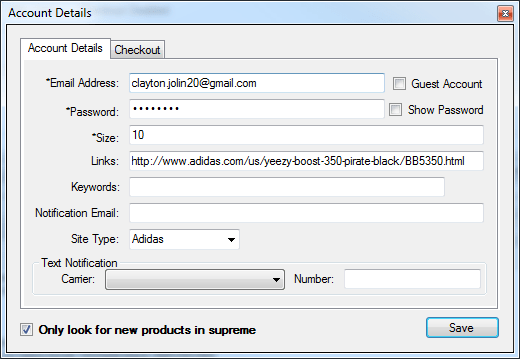 To check if a site on bnb aio supports guest checkout, just try to add a guest account for it. If it’s not supported, bot will not let you add. Try to use a combination of both guest accounts and normal accounts. 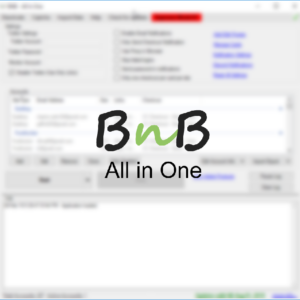 You can run only selected accounts in bnb aio if you want. To do this, select all the accounts that you don’t want to run; right click and do toggle disable. For sites that have keyword search option, there’s a slight possibility that the keyword search feature doesn’t grab the right link or doesn’t grab a link at all. Be prepared to stop the bot and edit all links quickly (there’s a bulk edit option) in that case. Use proxies if you are going to run more than a couple accounts on one site. Remember, you can always right click on an account and do open in browser if you wish to checkout manually. If you’re new to the team, please watch our videos on YouTube to get a feeling of how to use the bot correctly. Your FTL UK setup should look like above. To get DE or FR links, open the uk link in browser and switch country. That should give you the link for your country. Just add a new account to the bot. Enter your email address, size, link (from above), select the sitetype and you’re done. Then go to the checkout tab and allot a cc profile to the account. Once the link is live, bot will find the link. If not, you can use “Edit All Accounts” feature to quickly add the link to all accounts. The shoe dropped but there’s a chance they will restock. Object reference error means product is not live. Please note that the adidas module might not work because of the way it is. It will keep saying unknown error and notify you if and when the shoe is added to cart. If it works, it’ll bypass the captcha and perform automatic cc checkout. We’re working on a new captcha breaking method but the update will probably not be available before this drop. You’ll need to use adidas account for this. Guest checkout had to be disabled. Unfortunately we do not have an early link at the moment (keywords are not supported). We’ll update as soon as we get more information. However, the site will probably go down. So once the link is known, just run it and you’ll still have a chance.